Originally bred as sled dogs in northeast Asia, Huskies have dense coats that protect them against severe weather. The thick double coat of a Husky is made up of a coarse top coat and a soft, dense undercoat. Huskies are known for keeping themselves clean, but regular grooming is a must in order to control shedding and keep the coat looking healthy. It is important you find the right tools to maintain your Husky’s coat or you maybe spending a lot of time and money at the groomer. We have listed the best tools, to get the job done below. The Husky breed has a double coat and fairly short hair. The top coat, or guard coat acts as a protective layer against UV rays, debris, dirt and moisture. The undercoat is much softer than the top coat. It serves as an insulator and temperature controller which keeps the dog warm in cold months and cool in warm. 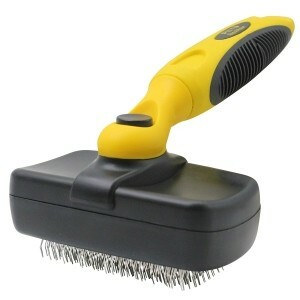 This type of brush is best for smooth-coated dogs that shed frequently. The bristle clusters remove debris, loose hair and leave a nice shine. A lot like the slicker brush, this brushes wire pins are tipped with plastic or rubber. Pin brushes are made for longer, silkier coat types. 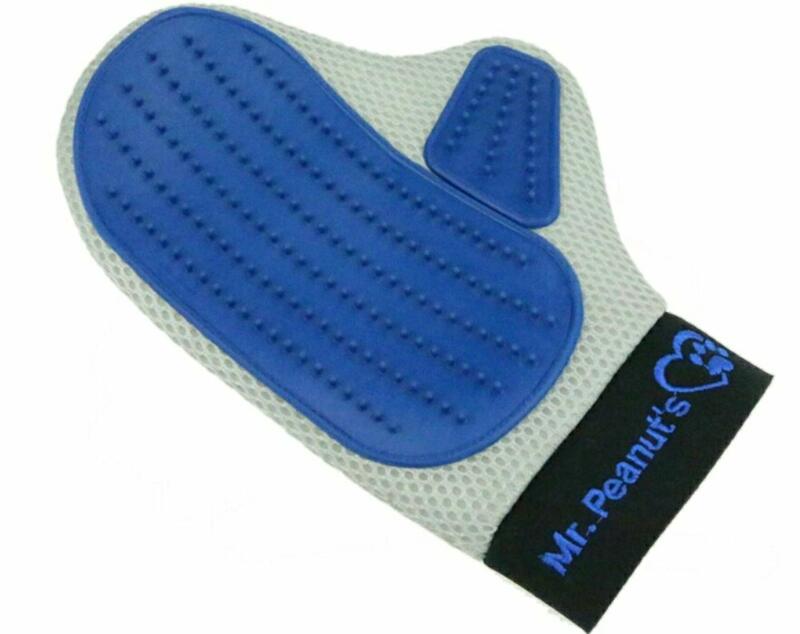 A grooming mitt is like a glove with rubber nubs that helps get those hard to reach places. It is used to remove dirt, dust and dead hair easily. This is used for mostly for shorter coats. This brush is really just a type of comb with small, harmless teeth. It is useful on almost every coat type for removing loose hair. 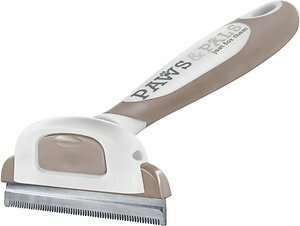 The Paws & Pals de-shedding and grooming brush is ideal for the times your Husky is shedding. This tool works great for removing loose hair dirt, and dander, as well as prevent matting. It reduces shedding by 90% and helps control your huskies undercoat when used correctly. The comfort grip handle is designed to fit easily in to your hand for maximum control. 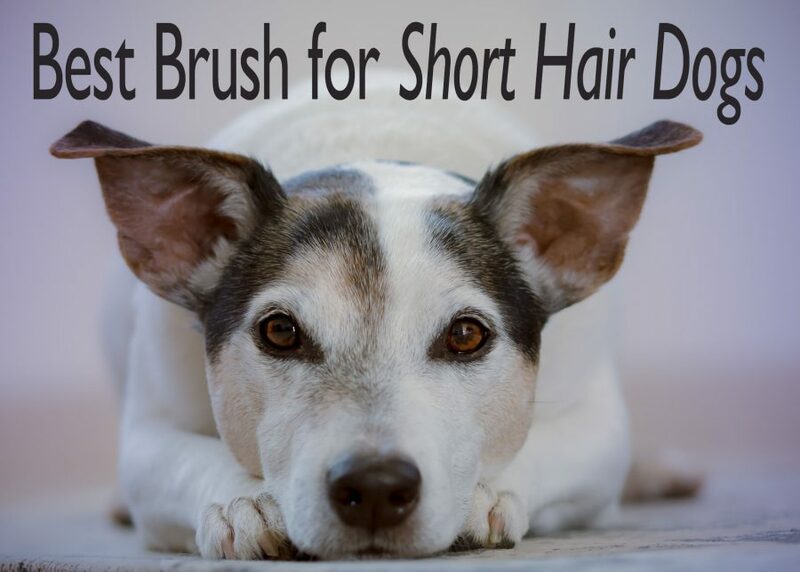 The Hartz Groomer’s Best Combo Brush is ideal for dogs with thick coats like Huskies. One side is fine stainless steel tips that has wide enough spaces to grab hair and remove knots. The bristles on the reverse side help to distribute natural oils that keep your Huskies coat shiny and soft. The handle has a rubber coated ergonomic grip to make brushing all types of coats simple yet effective. 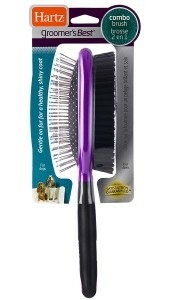 This slicker brush is made with fine and flexible wire bristles, and works great on Huskies coats. 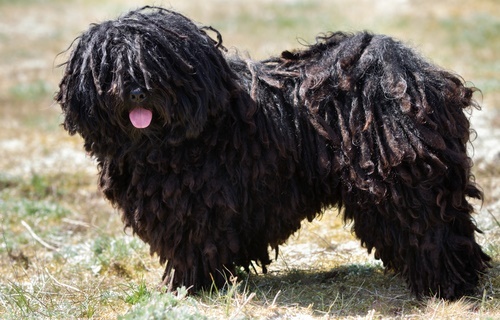 It removes dirt, tangles, loose fur and mats. This slicker brush can also be used for smoothing the coat after grooming, and the pins are long enough to get through your dogs under coat. The ergonomic, rubber handle and heavy plastic material makes it very durable and easy to use. 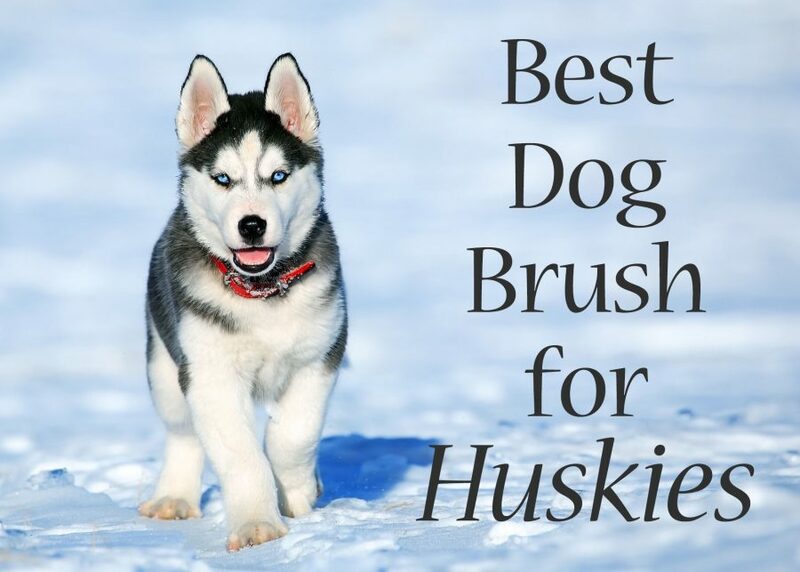 This brush has a self-cleaning one-push button feature, making clean up easy when dealing with the coat of a Husky. 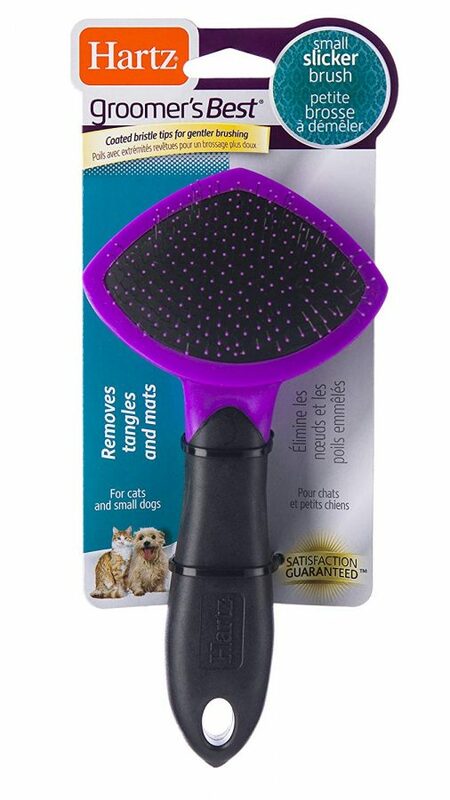 This small slicker brush removes tangles and mats with coated pin tips for brushing your Huskies face, ears or legs. This brush is designed to remove loose hair and dander while de-tangling matted hair and getting rid of debris and dirt. The fine stainless steel tips feature a protective coating so they are effective yet gentle when removing mats and distributing natural oils. 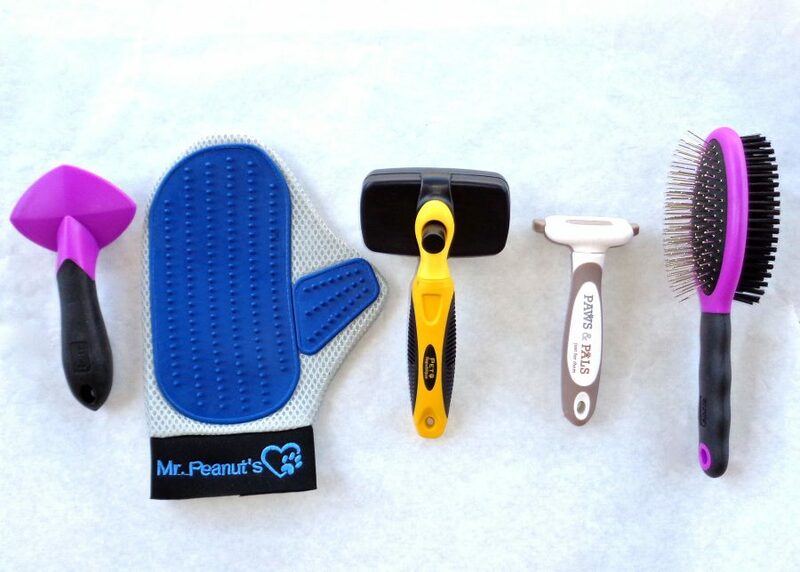 Mr. Peanut’s Grooming Glove is easy to use on all types of coats. The soft rounded silicone tips gently work to remove tangles and matted fur while lifting dirt and dust. It is good for daily brushing and can be used not only on dogs but on, horses, bunnies and cats. It is also machine washable for easy maintenance. Huskies sheds their entire undercoat once a year and the process can last up to six weeks from beginning to end. During this time the dead hair needs to be removed to stimulate quick and strong re-growth. Bathing and blowing dry will cause the hair to shed more but make it easier to comb out. Huskies needs very little grooming compared to other breeds with double coats, because no trimming is needed and just regular brushing to remove dead hair weekly. The Huskies undercoat insulates and the top coat provides protection from harmful ultra violet sun rays, therefore the coat should not be cut short. During winter, the coat is at high risk to mat if it is not regularly brushed due to moisture, and this will damage the insulation of the undercoat. Huskies “blow” their coat twice a year, usually in spring and fall. This means the undercoat sheds excessively while the new topcoat grows in. 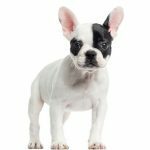 This process can take up to three weeks, and the aftermath will be extreme amounts of dog hair on furniture, clothing and floors. Huskies can suffer from a rare disease characterized by malfunctioning hair follicles, which results in patchy hair loss called canine follicular dysplasia. It usually occurs between the ages of 3 and 4 months. 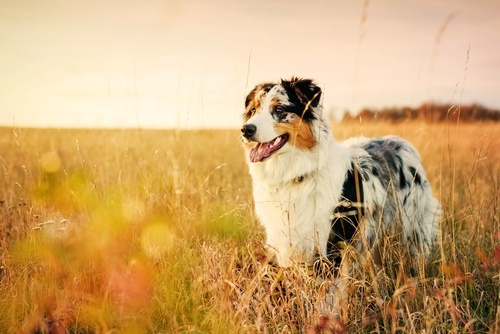 Weakened guard hairs break off, leaving a woolly undercoat which can turn a reddish color. The husky’s face and extremities are seldom affected. There is no specific treatment for follicular dysplasia, although it sometimes responds to melatonin. Alopecia X can also affect huskies and other Nordic breeds. The cause is unknown, but may possibly be a hormone imbalance. The husky’s primary hair falls out, leaving only a thin, fuzzy undercoat which eventually falls out too. The skin may darken or turn black as a result but there is no itching involved. This problem usually shows up when the husky is between 3 and 5 years old. Huskies require some maintenance and do shed a lot, meaning you may want to invest in a good pet vacuum. With the right brush or brushes, and regular grooming, your Husky will maintain the beautiful coat they are known for.